Harris Polling data in 2013. Beliefs by Americans of different faiths. 47% of respondents said that they believe in evolution -- apparently including those who believe in either theistic or naturalistic evolution. 29% said they don't believe in evolution. 31% said they don't believe in creationism. 36% of Republicans, 52% of Democrats and 51% of Independents believe in "Darwin's theory of evolution." 49% of Republicans, 30% of Democrats and 34% of Independents believe in creationism. Believers in Darwin's theory of evolution gained 5% in numbers. Believers in creationism decreased by 3%. These data are probably not statistically significant. "Because the sample is based on those who agreed to participate in the Harris Interactive panel, no estimates of theoretical sampling error can be calculated." 1 If the respondents had been randomly selected, the margin of error would have been ±2.1 percentage points. 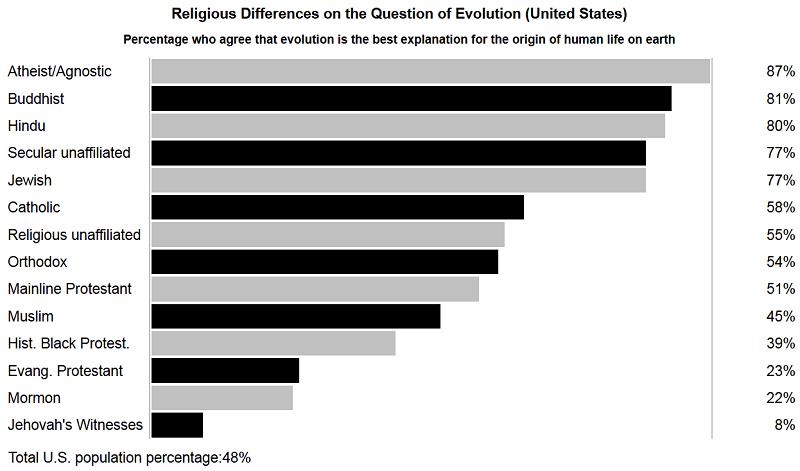 Wikipedia published the following graphic showing belief in evolution for Americans of different religions and faiths. 2 Data was derived from Pew Forum poll in 2007. 3 However, the data is probably fairly reliable for 2014 because teachings within various religions and denominations change very slowly. Why do people hold these opinions? "I believe that the Lord God created everything, just like the Bible says, I don't think we came from apes." Webmaster's note: Darwin was misquoted over a century ago by a reviewer of one of Darwin's books. He said that Darwin believed that humans are the descendants of apes. Actually Darwin had written that humans and apes had a common ancient ancestor. This misquote has remained active ever since. "It goes to the meaning and purpose of life. I think many Americans believe that somehow they are less special to God if they evolved from nonhuman animals." Webmaster's note: The main alternative to evolution is found in Genesis which states that Adam came from dirt. "I believe there is a God that's in control of creation. I've never gotten hung up on how he did it. ... I don't appreciate some of the caricatures of Kansans. Just because our school board voted that way doesn't mean we're [all] a bunch of bumbling idiots." As is normal in media reports, liberal/progressive religious sources and secular sources were not considered. If someone who was a Unitarian Universalist, Humanist, Agnostic, Atheist, freethinker, or other secularist were asked, they would probably comment that Genesis is a very beautiful myth, but not a story that should be interpreted literally. They might suggest that the authors of Genesis lived in a pre-scientific era and simply adopted creation legends from the surrounding Pagan Mesopotamian cultures.